Enid Dorothy Crystal Marx was born in London on 20th October 1902. She first went to school in Hampstead, then at the age of 12 she boarded at Roedean in West Sussex where she benefited from an excellent art teacher. 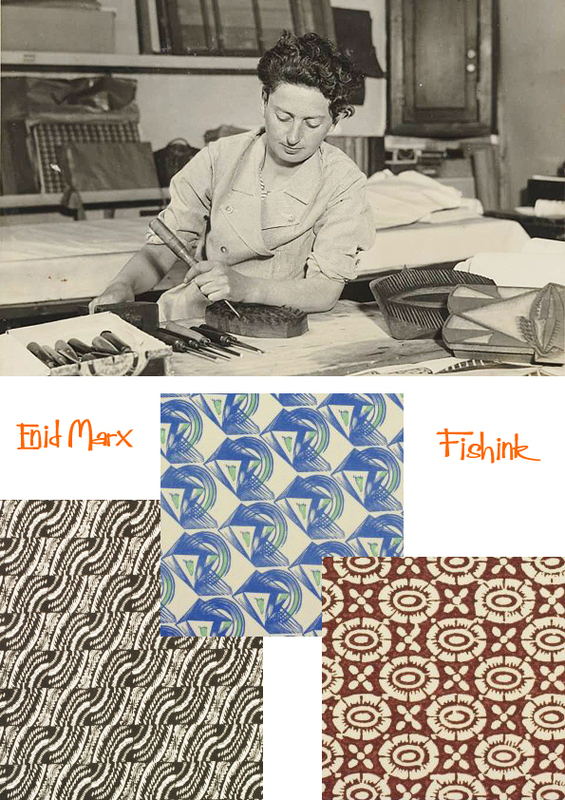 In 1921 she entered the Central School of Arts & Crafts to study drawing, pottery and printed textile design. 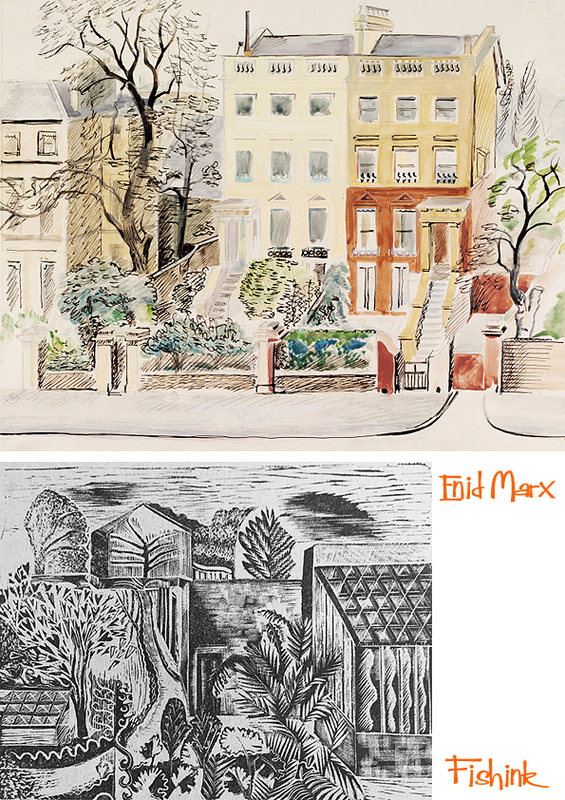 After a year she went to the Royal College of Art (RCA), where she studied under Paul Nash, among others, with fellow students, and future RDIs (Royal Designer for Industry), Edward Bawden and Barnett Freedman. The assessor failed her diploma piece as being too abstract but sixty years later the RCA appointed Marx an Honorary Fellow in 1982 and Senior Fellow in 1987. Gallimaufry, the College magazine, included Marx in its ‘Hall of Fame’ for 1925 because ‘among all the misses who flirt with Art, she alone woos it seriously’. 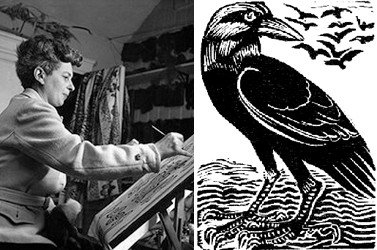 Nash recognized her originality as a pattern maker and he encouraged her to become an early member of the Society of Wood Engravers and the Society of Artists. Marx spent a year in the studio of Phyllis Barron and Dorothy Larcher as their apprentice. She learned how to mix dyes and the craft of hand-block printing on textiles. In 1926 she set up her own studio printing her usually abstract and geometric designs on various materials. These soon became extremely fashionable and sought-after. 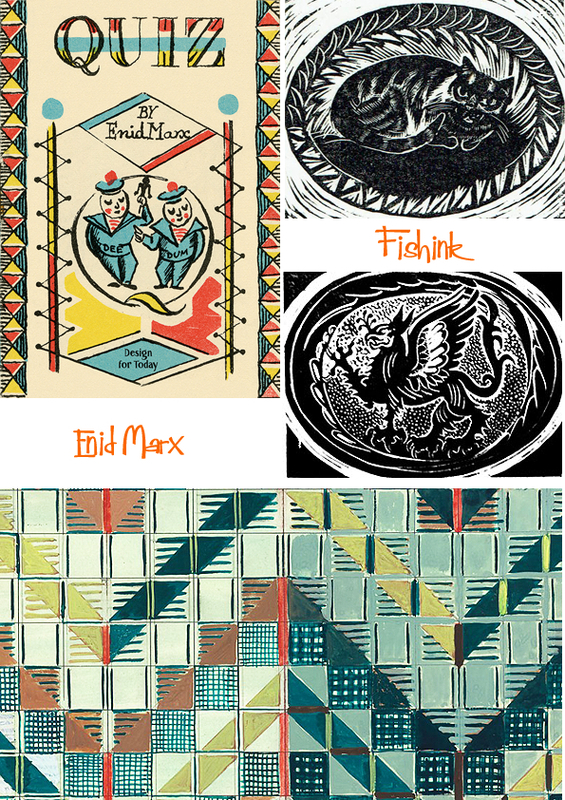 A reviewer of the 1928 Arts & Crafts Exhibition Society’s exhibition, for the RSA Journal, said that ‘Enid Marx is an able designer; her printed linen…might be taken as a good example of a good collection’. Two years later a review of her first one-women show at the Little Gallery elicited an appreciation of her designs, ‘somehow she manages to combine forms that are essentially in the modern spirit with large harmonies that have the most agreeable traditional suavity’. 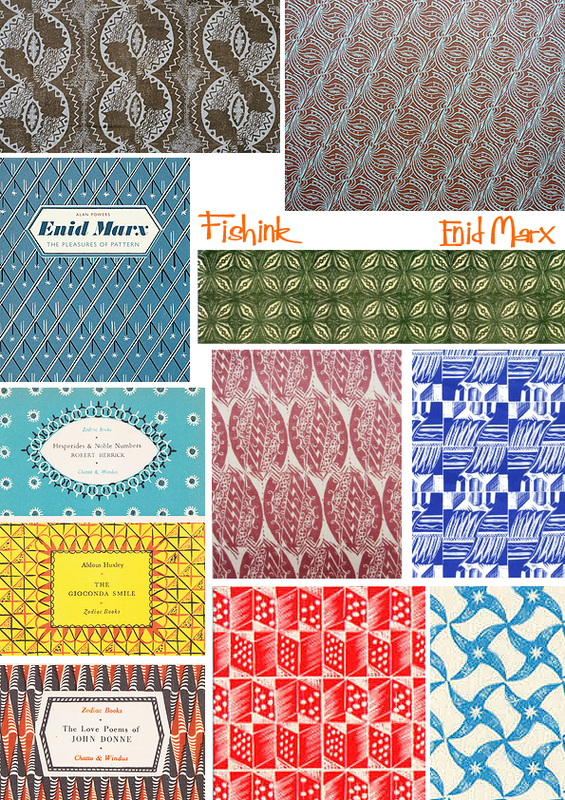 Just a small selection of the repeat patterns that Enid created. Marx showed her work at many exhibitions including Zwemmer’s ‘Room and Book’ and ‘Artists of Today’ shows, as well as the 1935 Paris Expo. 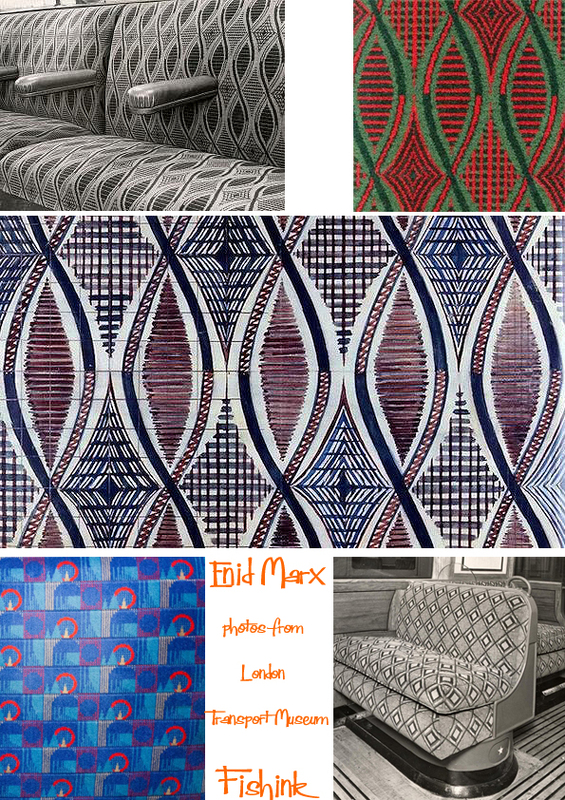 Christian Barman RDI of London Transport commissioned Marx to design seating fabrics for their trains and buses (1935). They formed a mutual admiration society, Barman praised her work and Marx wrote his obituary for Design magazine (1980). Other commissions included lining fabrics for luggage designed by John Waterer RDI. During the Second World War Marx was one of the artists invited by Sir Kenneth Clark to participate in his ‘Recording Britain’ scheme to record the country’s natural beauty and architectural heritage under threat from German bombing and other destructive forces. To her surprise her children’s book, Bulgy the Barrage Balloon, was an instant success. 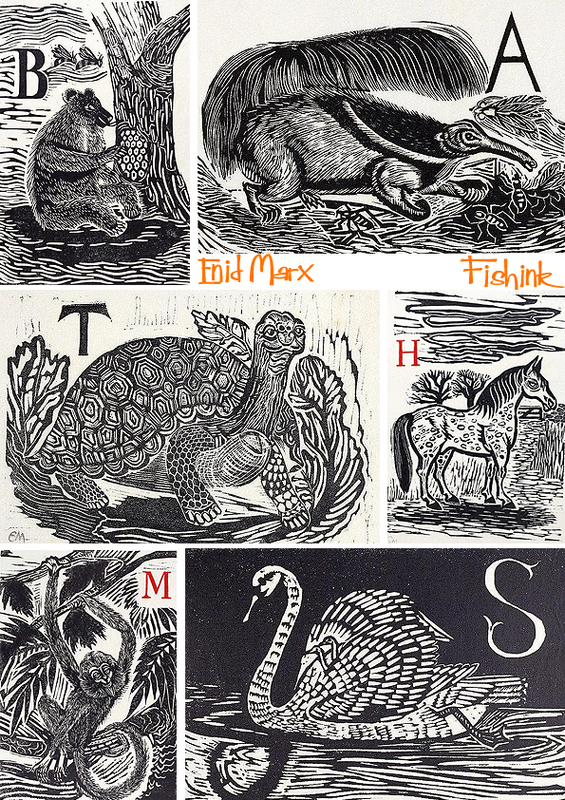 As well as writing and illustrating several more books Marx also produced little chapbooks, printed on off-cuts to amuse the young during air raids. 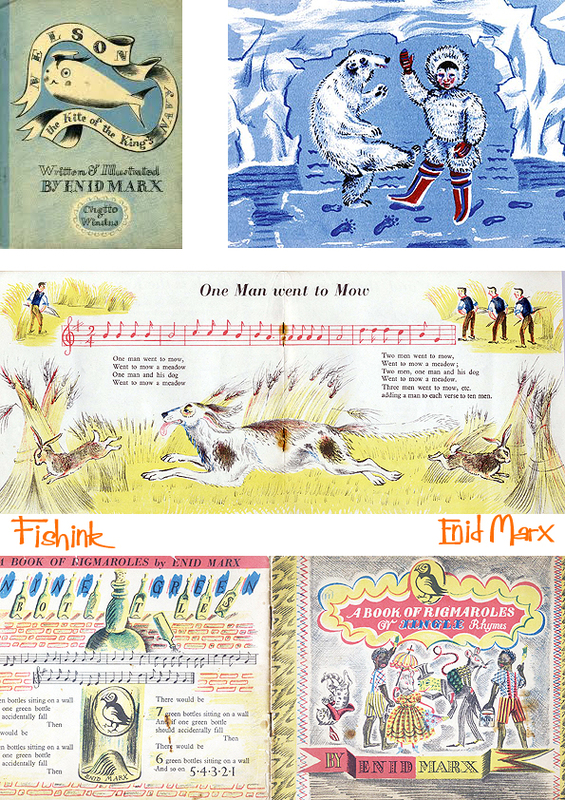 The invitation to design commemorative stamps for the Queen’s Coronation in 1953 provided Marx with the opportunity to work in a different medium. 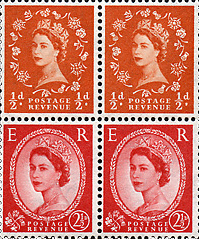 ‘Our stamps’, she said, ‘are, or should be regarded as, our Queen and country’s visiting card’. 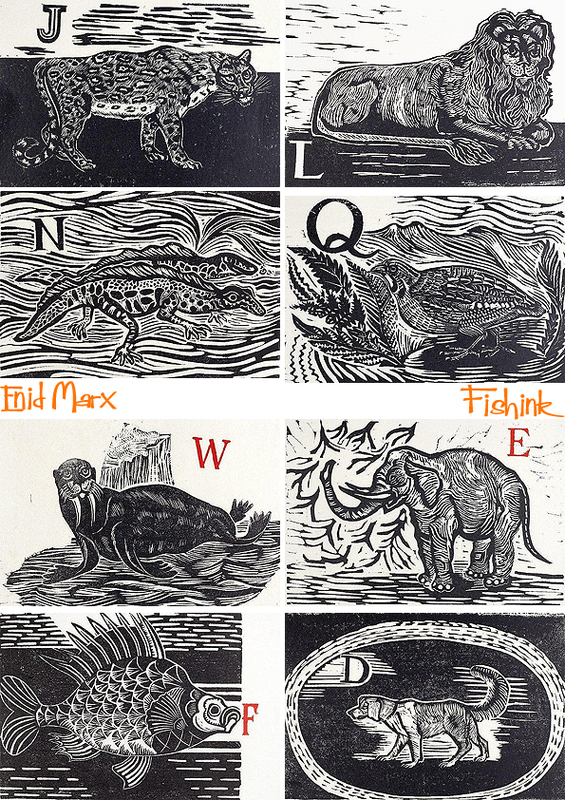 Marx described working on the stamps as one of her greatest pleasures. She received a further commission from the Post Office to design the Christmas stamps for 1976, her designs for these were taken from the ‘Opus Anglicanum’ embroideries. A small, dark determined woman of considerable stamina Marx campaigned ceaselessly for the continuation of the direct, unaffected, but human design values that her generation had established before the war. Enid Marx died in London, at the age of 95, on 18th May 1998. Many thanks to the University of Brighton Design Archives for the information for this post. Wow! That was a feast for the eyes! 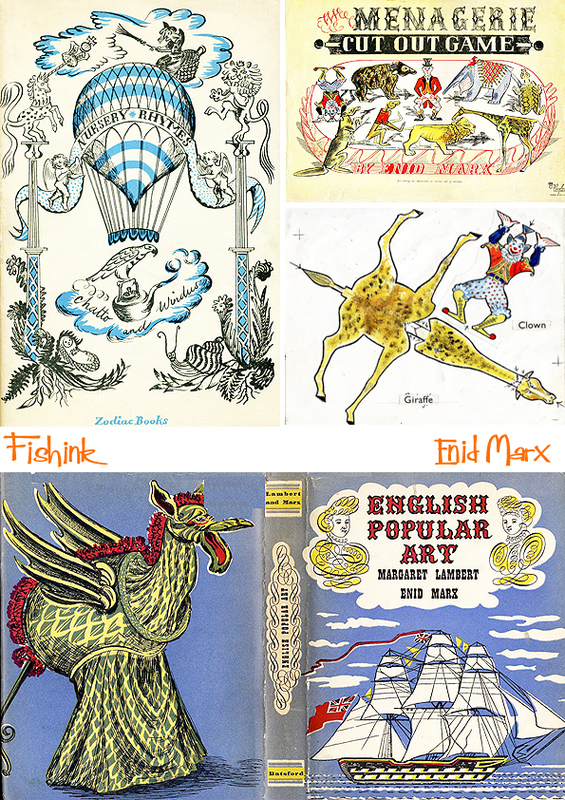 I had never heard of Enid before -so thanks for revealing the hidden treasures of her work. 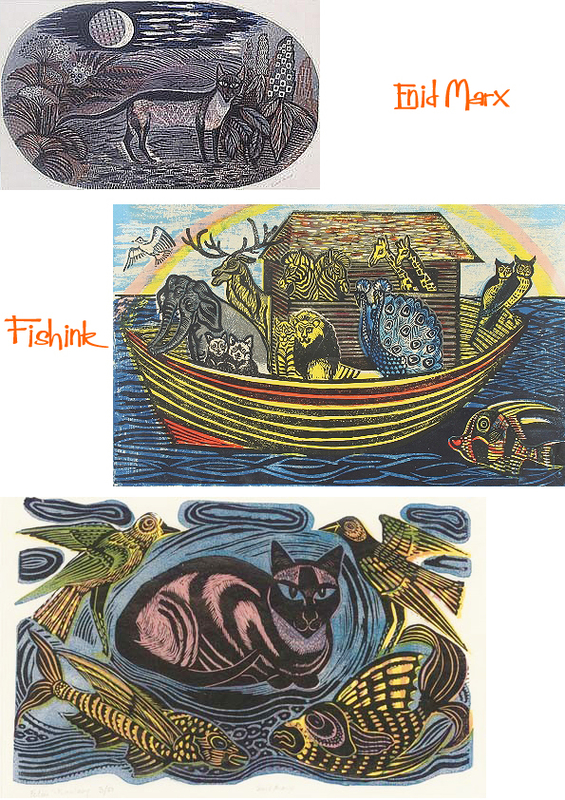 I especially love her woodcuts of birds and animals – the owl with the blue background is divine. I did a semester of copper plate engraving and printing when I studied visual arts at uni, finishing my degree last year. 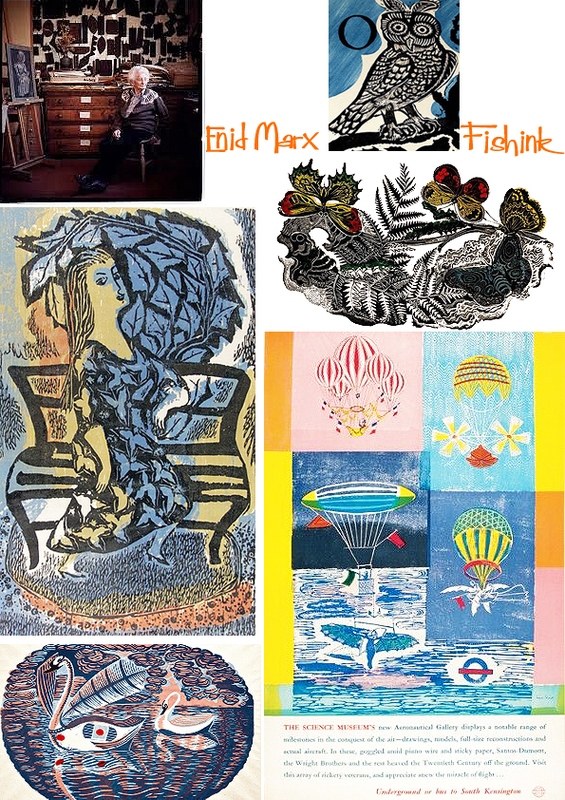 But Enid’s delightful work makes me wish they had taught woodblock carving and printing as well. Copper just doesn’t give the same effect. Such emphatic line work with wood. Sadly, it seems to be a dying art – at least in Australian art schools. Thanks Deidre, perhaps you should have a go yourself. I know that some contemporary artists in the UK, like Angie Lewin, still carve blocks from wood in order to get beautiful prints. Let us know how you get on if you decide to try it. That’s a great post you’ve put together. Thanks 🙂 Seems to be a lot of interest in Marx just now. 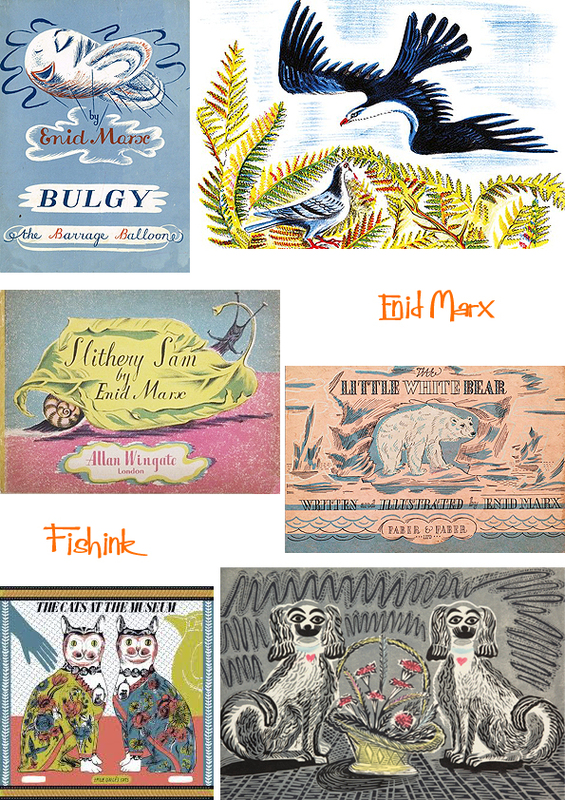 I’d love to see the exhibition at the house of illustration but too far away for me.